An abundance of young British talent spreading throughout movies here and abroad can often slip through undetected until a role shines the light on their formidable talent. Young Bel Powley is such a thespian sure to be ever so popular after her role as Princess Margaret in the delightful Royal Night Out and the upcoming Diary of a Teenage Girl, then starring opposite Guy Pearce and Nicholas Hoult in Equals. I spoke with Bel the day after the nation went to the polls and found her to be funny, smart, while honestly surprised when I mentioned her brilliant work in Little Dorrit. Hello Bel! I could first spot your talent since the BBC series, Little Dorrit. Bel Powley : Oh wow, that seems so long ago; that’s nice and wonderful to hear. Thank you. Have you been caught up in the recent British Prime Minister elections? Oh yes, me and my flatmate woke up a little upset with the results not going the way we hoped. Prince Harry recently visited Australia. Are you a ‘Royal Watcher’ or fan yourself, or met any of the family? Definitely. I was very excited when baby number 2 was born, and the fact she is named Charlotte is nice. I will call her Princess Charlie or Lottie for short. No, I haven’t met any but hope to. What was the process to be cast in Royal Night Out? Were you always auditioning for Margaret? Yes, I felt a bit of a connection to the role and read the lines to myself in my kitchen. I felt it came quite naturally, being the naughty one, the comedic aspect of her. I felt it was always a role I really wanted to go after. Luckily Julian Jarrold (director) thought so as well. It’s a comedy with much romance. Are you a romantic at heart yourself? The details of the costumes were immaculate. How was it wearing those gowns, dresses, shoes, and accessories? Amazing. It was a so fantastic to see the transformation that the designers created. They selected material to match skin tone; they were built and made from original pictures just for me to become Margaret. Even slipping into those dresses, corsets, gloves, heels and putting the fur on naturally made me feel like a Princess, even if I don’t sound like one. (laughs) I can curtsy you know. Did you keep any article of clothing? I wish, but they are probably put away in storage somewhere waiting to be auctioned off. Did the script change much during filming? No, it stayed the same really from the cast reading to filming, important story elements of fact we stuck with anyway. Acting opposite screen legends such as Emily Watson and Rupert Everett, did you ever just stop and think, wow! All the time, it was quite surreal playing their daughter, both such nice people with amazing stories. Never did I have a bored second on set, also they are so funny. Rupert as King George, even when he was trying to be so serious, he would just make me crack-up. Our little family was quite the fun one to be in. 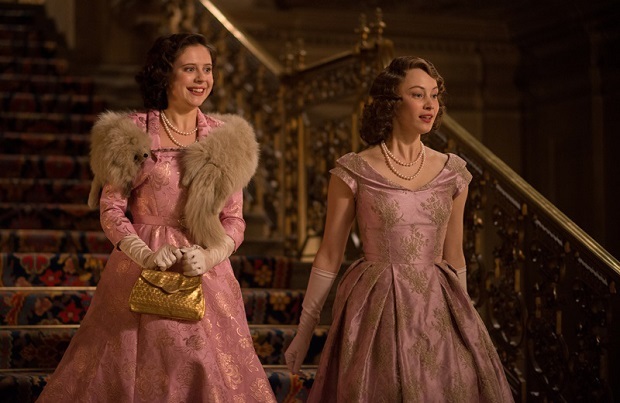 Your chemistry with Sarah Gadon come across like natural sisters, did you hang out together off screen? Sarah remains a really good friend of mine; I’ve seen her loads of times since filming wrapped even though she lives in Canada. We really wanted to portray a real sense of what it’s like for a big sister / little sister relationship, the protectiveness she has over Margaret, also the bickering. It was all easy to do with Sarah as she is such a lovely person. There is no way you couldn’t like her. Response at Sundance Film Festival was positive. How was that experience? Incredible, overwhelming, amazing to have a film go there, or to be so highly anticipated then for the reaction we got, I cannot explain the feeling. It was fantastic everyone liked it; the festival is so quick paced, busy. I tried not to let it affect me keeping my feet firmly on the ground. With so much high quality British period film and television around, why is Royal Night Out different for audiences to enjoy? Hmm, great question, it is different because of mixing a load of genres together, the romantic side, comedic side, then historical fact all mixed in with the magical element bringing the whole movie to life. It’s not a biopic but significant in a very important time period, while we made up fun things for the Princesses to do. That’s why it’s a unique movie. Is Bel short for a longer name? Yes, it’s short for Isabel, but no one calls me that. (laughs) You can. Thank you. With your Dad as an established actor were you always going to get into the business? No, people always think because I am from an acting family that I need to do this, but actually it’s the other way around. They know how difficult an industry it can be; I wouldn’t say they were discouraging, but they would have liked me becoming a doctor or lawyer. When I was younger, I did a TV show to save money for University but wasn’t until I did some theatre that I really fell in love with acting or character work. Now, I can’t imagine doing anything else. What can be said about Equals? You star with a couple of Australians, Guy Pearce and Jacki Weaver. Of course, it’s actually a real hard film to describe, so here goes. It’s set in a utopian society in a country that isn’t named and humans no longer have emotions. They strive to advance space travel, but we are not happy or not sad, we are not angry but not elated, then some people catch a disease that brings back some emotions slowly. It then turns into some romantic responses, but can’t say anymore of what happens after that. Thanks, Bel. I can’t wait for it, and well done in Royal Night Out. Thank you, Shane. Take care. A Royal Night Out is now playing in Australia and the UK.